April 30 (Cubadebate) Firstly, President Donald Trump, on adopting the erroneous and criminal decision to bomb Syrian territory, did not consult either with the United Nations or Congress, nor did he wait for the investigation to determine whether chemical weapons had indeed been used. It was precisely on April 18 that the work of the investigators of the Organization for the Prohibition of Chemical Weapons (OPCW) began in Douma, an area of Eastern Ghouta, close to Damascus. Although Trump and his allies in France and Britain have spoken of a “successful” operation against Syria, the reality is that 71% of the missiles launched were intercepted and destroyed by the Syrian Armed Forces, before they reached their intended targets. It is worth adding that on April 15, it was announced that with Russian collaboration, the Eastern Ghouta area had been completely cleared of terrorists, a success celebrated by residents who returned to their homes, as children resumed their studies and workers returned to their jobs. 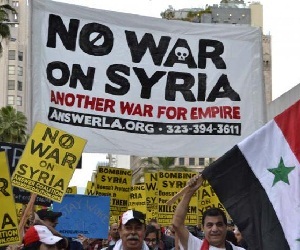 In the international arena, the attacks have been criticized both in the United States, where demonstrations took place in some 40 cities, and in other places, with calls to respect Syria’s territorial integrity. The Russian representative to the OPCW, Alexander Shulguin, announced that Russia has irrefutable proof that no chemical attack took place in Douma. However, as expected, European governments, as well as the Gulf monarchies, have expressed their approval of the attacks on Syria. Syria’s seven-year war has left almost half a million dead and resulted in crippling destruction of infrastructure. This is not the first time that these governments have bowed to such imperialist actions, without stopping to analyze the lie used as a pretext and the possible consequences of such acts. While Trump has cynically claimed that he acted in accordance with the U.S. Constitution, it is not surprising that some European leaders have described the attack as necessary to stop Syria’s alleged use of chemical weapons. The UN Security Council demonstrated its bias when a majority opposed the Russian resolution that condemned the attack and demanded that it not be repeated. The green light given to Washington in this global body, which should guarantee peace rather than vote in favor of war, is a real slap in the face to the international community. Russia’s Ambassador to Washington, Anatoly Antonov, warned that the attack launched on Syria by the United States, the United Kingdom, and France will have consequences for these countries. “The worst apprehensions have come true. Our warnings have been left unheard. A pre-designed scenario is being implemented. Again, we are being threatened. We warned that such actions will not be left without consequences. All responsibility for them rests with Washington, London, and Paris,” read an official statement. Meanwhile, French President Emmanuel Macron assured that the bombing was not a declaration of war against the government of Syrian President Bashar al-Assad, but in defense of international law and UN resolutions. Macron described the attacks as a “military success,” noting that, “The operation against the chemical capabilities of the Syrian regime… has achieved its objectives,” and stressing that there had been no collateral damage. Meanwhile, Spanish newspaper El Mundo Washington correspondent, Pablo Pardo, wrote that the military operation against Syria has cost between 73 and 143 million euros. He also noted that Trump “premiered” the new JASSM-ER missile against Syria, manufactured by one of the largest arms dealers in the world, Lockheed Martin. The Joint Air-to-Surface Standoff Missile-Extended Range is launched from planes, carries half a ton of explosives and has a range of more than one thousand kilometers. This must be the weapon that Trump was referring to when he warned Russia that “nice and new and smart” missiles would be used against Syria. Regarding the attacks against the Arab nation, the Presidents of Russia, Vladimir Putin, and Iran, Hassan Rouhani, agreed that the bombings damaged the possibility of a political solution to the Syrian conflict. Not content with all the actions taken to date against Syria and its Russian and Iranian allies, Washington announced it was considering new economic sanctions against Moscow-based companies. In response to the announcement, Evgeny Serebrennikov, deputy head of the defense committee of Russia’s upper house of Parliament, stated that Moscow was “ready” to face the sanctions. “They are hard for us, but will do more damage to the U.S. and Europe,” RIA news agencyquoted him as saying. What is clear is that once again a pattern of lies was imposed to militarily attack a sovereign country. Meanwhile, modern and sophisticated missiles cross the skies over a nation that believed it was reaching the end of a seven-year war, which has left almost half a million dead and resulted in the crippling destruction of its infrastructure.